The gateway to Dublin, Ireland’s capital and one of the World’s top thirty alpha cities, this international airport welcomes all manner of visitors from nearby and further afield alike. Known in Gaellic as Aerfort Bhaile Átha Cliath, the airport has won various awards in its history and was named Airport of the Year in the category for medium-sized airports that have fewer than 30 million passengers per annum at the prestigious CAPA Aviation Awards for Excellence in 2017. Dublin Airport is located a 30-minute drive outside of ‘the Fair City’ in neighbouring Collinstown, Fingal. 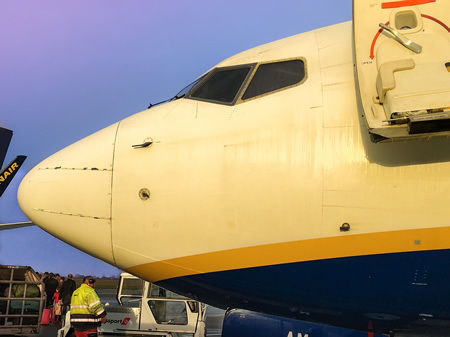 As a major tourist destination, as well as a high-profile connecting airport for flights to North America, Dublin Airport is easily the busiest of Ireland’s three major airports, above Cork Airport and Shannon Airport. Consisting of two terminals, Dublin Airport is the fifteenth busiest airport in Europe, having welcomed close to 28 million passengers through its doors in 2016, a record high for the airport at a raise of over 150% from 1998. Dublin Airport has excellent transport links, including bus routes, and rail links into the centre of Dublin and beyond. There is also opportunity to hire a rental car for your trip and make the most of the Fair City and the rest of the gorgeous East coast of Ireland. 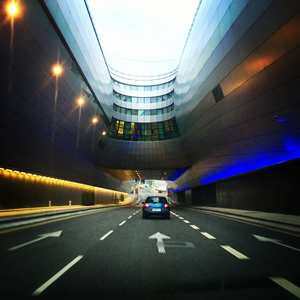 Book today for the lowest price for Dublin Airport car rental with Easirent. We have large selection of small cars, family hatchbacks and large people carriers to give your Dublin visit the perfect start. 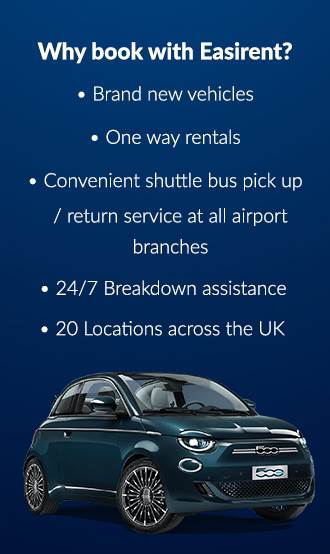 Simply order online and when you arrive at the airport, we pick you up to take to our local branch. The busiest transport hub on the entire island with the highest volume of traffic, Dublin Airport has been operating for nearly 80 years, having first opened in January 1940 with its first flight being to Liverpool on January 19th 1940. Today, Dublin Airport is owned by the Irish Government and operated by DAA (formerly known as the Dublin Airport Authority) and offers passenger flights, as well as a number of cargo flight services from providers such as Air France, DHL and UPS amongst others. As a major international airport, Dublin Airport is home of the headquarters for a number of airlines including Irish airlines Ryanair, Aer Lingus, ASL Airlines Ireland and regional airline Stobart Air, as well as being home to the headquarters of CityJet and Norwegian Air International. Dublin Airport has the distinction of being one of only two airports in all of Europe to offer border preclearance services to the United States of America for passengers bound for the US, the other being Shannon Airport. This has only strengthened Ireland’s relationship with the United States, and has led to increased traffic to and from the USA, with roughly 1.5million passengers a year using routes between Dublin and New York JFK, Chicago O’Hare and Boston Logan International Airport, with other flights available to and from Philadelphia, Charlotte, Atlanta, Miami, San Francisco, New Jersey, Los Angeles and Washington D.C.
Dublin Airport specialises in flights throughout Europe, with nine of the airports top ten flights being in the region. Most major flight operators have services running in and out of Dublin Airport, such as British Airways and Air France, as well as many budget operators such as WOW Air and EuroWings amongst others. Dublin is also a seasonal destination for many different operators, with Canadian airlines Air Canada and Air Transat running seasonal flights out Montreal and Vancouver, alongside their year round flights to Toronto. A new runway is set to be built to replace the now dis-used runway 11/29 and will run parallel to runway 10/28. This new runway, scheduled for completion in 2020, will allow direct from flights between Dublin and the far East, with a pre-project schedule seeing multiple flights weekly to and from Hong Kong, starting June 2018.This new expansion has been in the works since 2007 and will significantly boost efficiency and allow for more flights in and out of Dublin Airport in the future. Dublin Airport is proudly home to ‘the Loop’ shopping experience, giving travellers a choice of all manner of gifts and goods for friends, family, or even just for themselves. Billed as ‘a world of tempting eateries and exciting brands,’ The Loop offers savings on a wide range of products and is available in both Terminal 1 and Terminal 2. The Loop also offers a shop and collect service to those travelling within the European Union, allowing travellers to collect their purchases upon their arrival back into the airport. Fans of perfume, aftershave and skincare can pick-up a number of items from international brands such as Bvlgari, Tom Ford and Bobbi Brown and many more. Stand-alone retail spaces are also available for brands such as Jo Malone and Hugo Boss in Terminal 2, but half the fun of duty free is exploration and finding that one item you have had your eye on for a fraction of the price. It isn’t all fancy sunglasses and luxurious fragrances though, as you can stock up on a range of alcoholic products, from crowd pleasers like Smirnoff and Jack Daniels, to Irish whiskies and institutions such as Guinness. Guinness has its own stand alone ‘Guinness Export House’ in Terminal 2, allowing visitors the chance to stock up on ‘the black stuff’ as well as all manner of paraphernalia. Importantly, Dublin Airport also has a vast range of different eating and drinking facilities available, whether you require a quiet space and a hot meal, a quick bite before you board, or a hot drink to sit over as you read the paper. You will find the instantly recognisable fast food and drink chains such as McDonalds, Burger King and Starbucks at both terminals, with dining options available before and after security screening. Dublin Airport also offers Platinum Services, tailored exclusively to executives, but also perfect for those who want a simpler more sophisticated airport experience. The Platinum Services include everything from private check-in and screening, private lounges and executive meeting rooms, to chauffeur service from lounge to aircraft to give your trip that added ‘wow’ factor. Prices start at €185 per person for Platinum Services. For those after comfort without breaking the bank, Dublin Airport also offer travellers the chance to book into their Executive Lounges. Available in Terminals 1 and 2 for outbound flights only, Executive Lounges are quiet comfortable and air conditioned, with free wifi as well as complimentary snacks, drinks, and newspapers. Booking costs are €25 online, or €29 in the airport itself. Dublin Airport has all manner of services and facilities at every passenger’s disposal, from standard services such as lost luggage, to specialist services for those with specific needs and requirements. 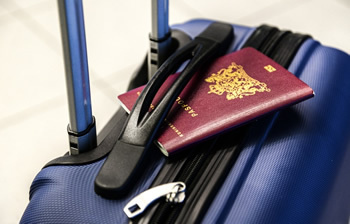 The airport also has a Bureau de Change for all currency needs, as well as multiple internet and printing facilities should you need to print any last minute documents for your impending trip. The airport also has various WiFi hotspots throughout, with free high-speed spots in the Airport Executive Lounges. Dublin Airport is also home to a multi-faith prayer room in Terminal 2 which is available 24 hours a day. As it is for use for people from all faiths and walks of life, Dublin Airport asks that all patrons take care and be aware of the religious sensibilities of others. There is also a Catholic Church, Our Lady Queen of Heaven, which has been situated in the airport grounds since the 1960s, and is a short drive from both terminals, amongst the car parks. There are also various baby changing facilities and toilets located throughout both terminals, as well as medical aid facilities and a pharmacy in Terminal 2. Smokers should also be aware that the airport operates a strict no smoking policy punishable by fine, however there is an airside smoking area in the Garden Terrace Bar in Terminal 1. It’s on the way to Gates 101-121/201-220.